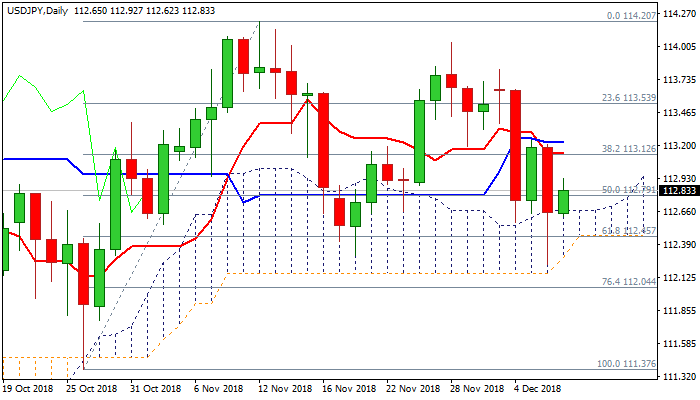 The pair holds above daily cloud in early European trading on Friday and shows scope for further recovery, as cloud top (112.67) remains key near-term support. Thursday's strong fall penetrated daily cloud and was contained by 100SMA just ahead of cloud base (112.16), with subsequent bounce leaving long-tailed daily candle. This signaled strong downside rejection and along with repeated close above daily cloud top, suggesting that bears lack strength for sustained break lower and fresh recovery could be likely near-term scenario. Rising bullish momentum on daily chart supports the notion, with recovery facing a cluster of daily MA's between 113.05 and 113.30, close above which would signal reversal and expose targets at 113.82/114.03 (03 Dec/28 Nov highs). Strong US jobs data today would add to positive signals. Bearish scenario requires close below daily cloud base/100 SMA to signal further weakness.